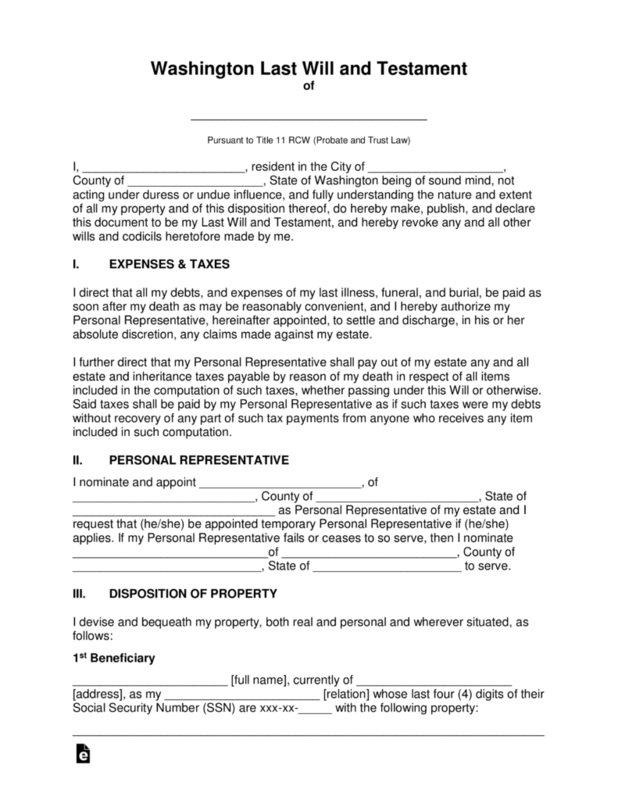 The Washington Last Will and Testament is a document that allows a Testator, the creator of the Will, to set forth intentions that specify how they would like their estate to be distributed upon their death. Assets for distribution may include businesses, digital property, real estate, personal property, life insurance policies among other important assets. Generally, assets are distributed to continue the financial security of the immediate and some extended family. However, some testators choose to make charitable donations for educational institutions or even specific research facilities for various personal reasons. After the testator feels they have constructed their document to their satisfaction, it must be signed by two witnesses and acknowledged by a notary. Revisions and revocations are allowed to any testator of sound mind at any time. Signing (RCW 11.12.020) – Signed by the Testator and by Two (2) Witnesses by either signing the Will or an attached affidavit to the Will. 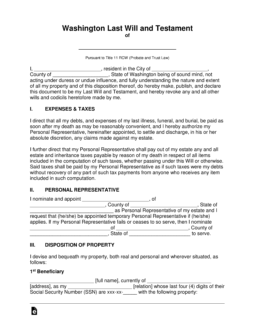 Step 7 – Notarization – Once the document is complete, all signatures must be witnessed and acknowledged by a notary public of the state.